"Thanhouser film "For Her Sake," 1911"
Thanhouser drama “For Her Sake,” released February 14, 1911. 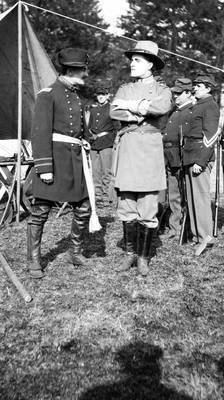 William Garwood at right, in confederate uniform. REVIEW, The Billboard, February 18, 1911: "Here's a very good story, one appropriate for the holidays now upon us. The story deals with two lovers, one who joins the Northern army, the other the Southern. Both seek the same girl, the Southerner in an honorable way and the Northerner in a jealous, mean manner. In combat the Southerner is taken captive and is mistreated by the jealous Northerner until the girl finally locates him in prison and aids him in his escape. The guards shoot, and instead of wounding the rebel, kill the girl, whereupon the two soldiers become friends after they find that their object of their jealousy has been so sadly removed. The setting of the camps is very good and one that lends a decidedly martial atmosphere to the production."